A few more pictures. I tried to add these to my earlier post but for some reason they didn't show up. I took this to work this more and it was mostly all eaten up. Goes great with coffee so I'm told (I don't drink coffee). These were taken outdoors so the lighting is much better. 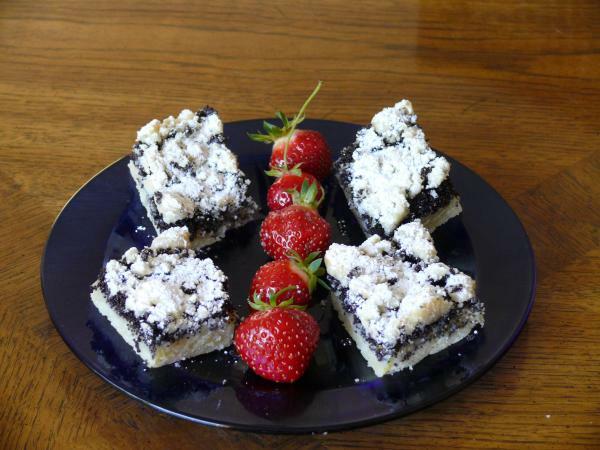 Mohn bars and 92% WW SD..
My take on Mohn bars, very tasty. I love the cookie base. I haven't had any bread assignments in a while, so I needed a bread fix. I can still do it!! 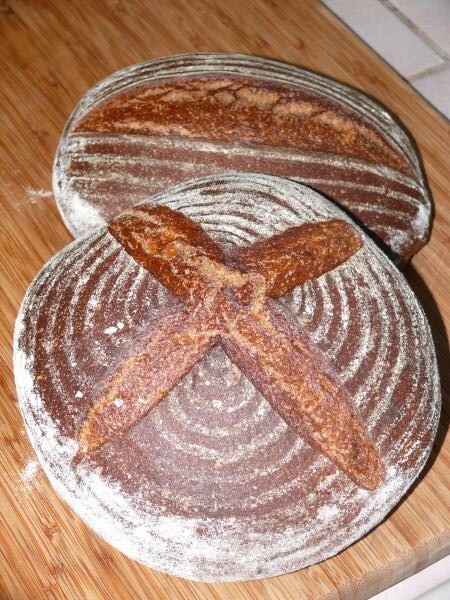 This 92% WW Hearth sourdough was from Reinhart's ABED. It's supposed to 100%, but I used my rye sour, since I didn't have a WW starter. I love this bread! It has the natural sweetness of WW. The dough comes togther perfectly with stretch and folds. We met a baker sampling his wares from his new bakery ( I think called Rising Up from Jacksonville, OR). We got talking and he told me his WW SD came from one of Peter's books. Working with WW is totally different and can be challenging (at least for me). I'm hooked on this bread and can't wait to play with it some more. They look delish! Nice photo of the mohns too. Nice contrast and use of color. Does the WW taste as good as it looks? Quite a business, this one. I ended up including baking powder in my sponge mix, this being prior to the final advice that it shouldn't have been in the formula. Probably fortunate that I did in the end, because the sponge didn't have enormous rise. Actually, I was unimpressed with the sponge. It had that eggy background taste - really dislike that in a sponge - which is likely attributable that to the high proportion of eggs to flour in the mix. Never seen a sponge mix like this before. Also, I found the recommended oven temp of 205C far too hot (as suspected - have never come across a sponge baking temp higher than around 175C until now). My sponge had browned just 4 minutes into the baking time, and after dropping the temp dramatically I dared not give it any more than 7 minutes total in the oven - well under the time stipulated. It was cooked, but ended up a little dry. However, despite the issues with the sponge, the chocolate cream filling was superb, and the chocolate fudge icing also nice. And eating the cake, I was glad to find that the egginess that was noticable in the sponge by itself was well camouflaged by all the other yummy flavours coming from the filling and topping. Worth the effort? 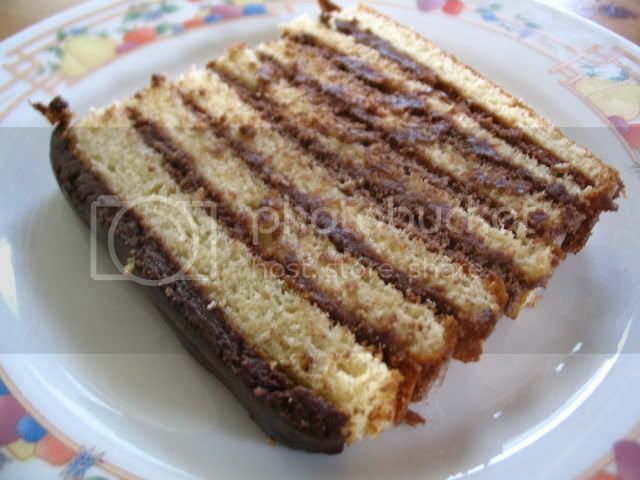 No, not as is (not for me, at least), but I do think a modified and simpler version of this cake could be sensational. 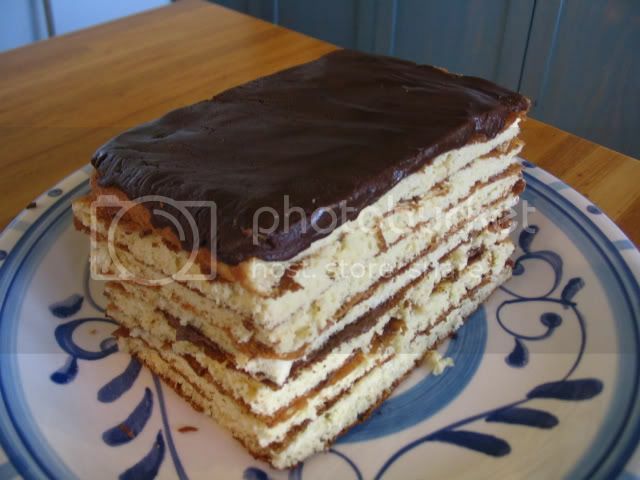 That is, a better sponge using a more traditional mix, 3 layered, with thicker chocolate cream filling between each layer, NOT compressed, and finished with a topping of the chocolate fudge. Then again, maybe others like it just as it is. Anyway, here's a coupla pics. Wasn't sure whether the directions to 'finish off' the cake with the chocolate fudge meant to ice it all over, or just to top it. Decided on the latter (and yes, heavy-handed and rather clumsy effort with the icing). Well it came together. The frostings are very very sweet, too much for my tastes. 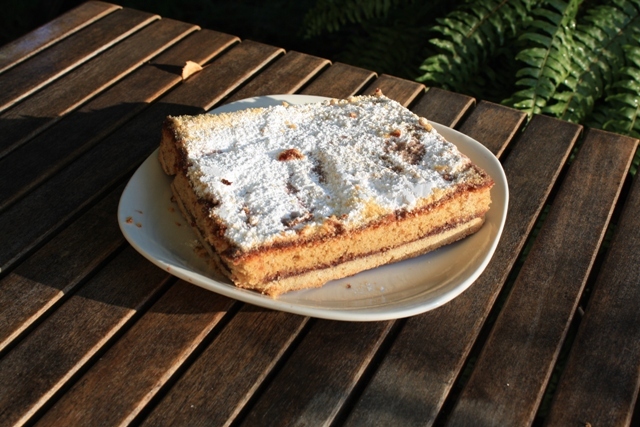 The cake tastes good, I used less salt and no Baking Pwd. The butter cream is smooth but the fudge frosting feel is sugar gritty between my teeth. I added cherry rum to the fudge frosting hoping to smooth out the texture to no avail. It needs to chill longer in order to cut it, the first piece fell apart a little between sections. I did have wide packing tape wrapped around the parchment to support and hold in the sides while chilling. Afternoon coffee? Sitting on a bottom of a spring form pan. I see roses again! The first two pieces I just rolled up on their sides and then stood it on parchment and continued wrapping the pieces around with a little frosting on the ends. The last of the butter cream went on top to seal it before chilling. There is a thin layer of Fudge frosting on the outside with half of it put into the fridge for something else. I share your views on the sweetness of the frosting. Was glad I ended up confining it to topping (although that was misinterpretation and slackness on my part, not by design). I noticed a bit of grittiness, also, but I'm not sure why this should be...icing sugar shouldn't be gritty. Maybe baker error of some sort in my case. I thought the star of the show was the butter cream. That part of the recipe is a keeper as far as I'm concerned. Looking forward to your crumb shot. I really like your roll job!! Interested to see how it does after slicing. Imagine my surprise when I tucked a almost whole cake into the fridge last evening and opened the cake box this morning to find half a cake! It could only mean one thing... my lab rats were on the move last night. You have a choice... 7 layers on the left side, 6 on the right... Which will it be? Is there any reason or story behind "the seven layers?" SMS from the #1 lab rat, "They liked your cake!" (Gee, "they're" mysterious!) The only evidence they left was the missing cake. "They" must have cake-napped it and slipped out the door with it. See how clean the cake plate is? Hijacked a half a cake??? WOW!! Testimony to it's goodness! 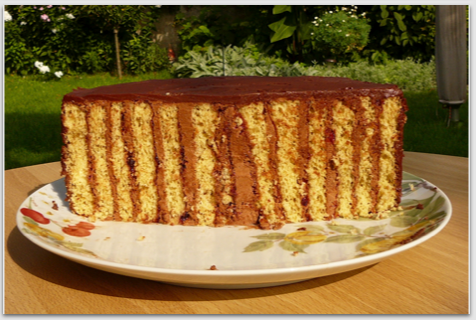 So, did you think the sweetness of the buttercream was tempered by the cake or still too sweet? I love the way you always think outside the box, you're an inspiration Mini! It did taste better the next day! And I was alone with it... I had to get the rest out of my sight or my diet was doomed. I have a neighbor who routinely trims the long grass around his nephew's field. On Monday he was in good spirits and kept going trimming my section to the drive. He didn't have to so I brought him 1/4 as a reward. It truly made his day. The other quarter went to my neighbors across the street. I am still beholding to them for saving the solid steps (50kg each) from the old house they tore down. I've been busy putting them into my little hill side garden. Even with half of them in, the danger from falling on my rump is greatly reduced and I can get more use and joy from it. Back to the cake... If I balance the cake to buttercream, I would use less between and more layers of cake. The jam I used was tart and I make it low sugar. Lab rat #2 was sad to find the cake gone, said it was sweet but then "...you just have to slice off a smaller piece." Easily done. The unknown lab rats also commented on the rough texture of the fudge. I put a small dip of extra frosting into my afternoon coffee yesterday, not bad. I used less salt than the recipe and I was thinking about the eggy comment and think that if all the salt and then baking powder was also in the recipe (which is salty) that might bring out the eggy taste. 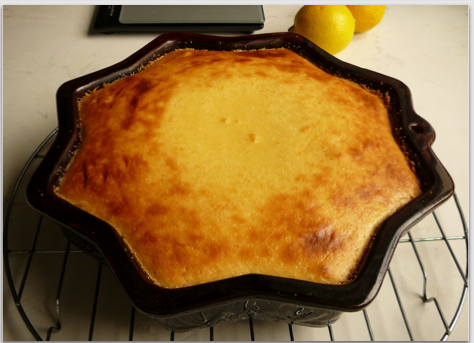 This kind of egg-only cake batter is common here known as a "bisquit" (biss--rhymes with kiss and quit--as in stop) and although it has lots of eggs (4 per sheet is not a lot) it is a large recipe. I did not find it eggy. I used a larger mixer bowl for beating and had to hold my mixer. 12 minutes gets pretty tiring. I'm sure to have better looking arms now! This is the first time making this batter using this method. A learning experience. I did have to be careful to scoop out the dough onto the pan and spread it very even without popping too many bubbles and still had thick and thin layers. I used convection at 160°C for the recommended time. I'm sure to find out how my neighbors found the taste of the cake. I explained that they would become tasters and that I valued their honest opinion, if anything should pop into their heads while eating it, they should tell me. After all the talk about the cake, I'm sure they ate it for lunch with coffee as soon as I left. The fudge frosting remains fine gritty in texture, I wonder if not the order of mixing could be changed. I had a big dust cloud of cocoa powder above the bowl while mixing so I draped my mixer motor with a damp dishtowel to protect it from dust until the frosting was wet enough to remove it. of the area you live in and especially your hillside gardens. I've yet to travel to Europe but hope to get there someday - the cake looks delicious but I'm glad that I wasn't one of the testers on that one! Well, its week 12. We are almost done. Those in my group were given a recipe for Tayglech. Its sort of like a popcorn ball made from tiny cookies. It was time consuming to set all the little cookies onto the pan. The directions said to make sure they didn't touch. TaDa! If you get a bite with cookie, almond, and cherries, it is really a treat. Or you can kind of pick it apart bit by bit. These are like tiny works of art! It looks like you did a great job. These would make a wonderful holiday treat. Great Honey Balls - look delicious! You did a great job getting all those pieces of dough on the baking sheet - I did not see even one that was touching. 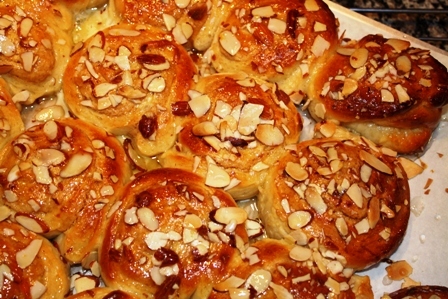 The cherries and almonds contrast each other very nicely and the equal size balls look nice too. I am always the kind of guy that looks for the biggest one of a treat to choose - not with yours. Take care and share these with your friends and family - especa\ially the two year old that loves Mohn Bars. Any one else making the honey balls, You may find your self with a bunch of egg whites left over. Who is up for a round of macaroons? Yes, Let call it a challenge to all the YNB test bakers. Make French Macaroons. Be ready to post photos. Is 2+ weeks enough? Shall we say on the 8th of September? Or maybe just leave the end date open. I know I tend to procrastinate without a deadline. P.S. I created a Forum topic about it here. Those look so good. Wish I had received that recipe. Maybe I'll try to guess. One question: Is almond paste used? It would be good to find some (good)uses for this leftover paste I have. The filling does include about 1/4 c. of almond paste and cake crumbs! Who knew the uses for cake crumbs.? This is one of the things I've learned from this testing experience. I actually made almond paste a few weeks ago but I also decided to order some from www.nybakers.com to compare differences between the homemade and the commerically made. I have to say that the commercial paste wins out. The consistency was much better than my homemade. I will be freezing all of it and using it during the holiday season for some of these wonderful recipes I've made with it. 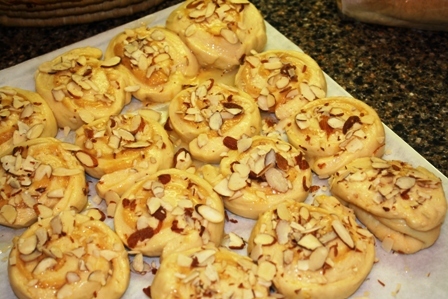 I had never used almond paste until this summer. Gotta' tell you Mr. Frost - these taste as good as they look =). The cheese cake is chilling in the refrigerator now so I don't have a picture of the slice but here's a picture of the cheesecake itself. 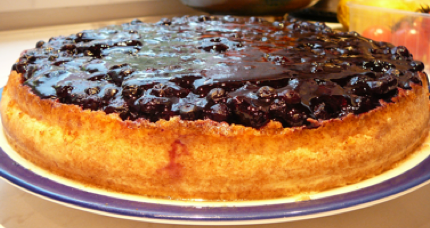 It was a fairly simple recipe made in a cake pan - I've always made cheese cake in springform pan so this was a new experience for me. I haven't tasted chilled yet so I'll get back to you with a slice picture and a "taste" report. Looks delicious. What type of cheese and/or other dairy creams were called for? Mine is for "sour cream cheese cake", but I didn't make it yet. Luckily, it also calls for just a cake pan, because I don't even have a springform pan. While I can't vouch for your spring-form, I did use a relatively new one (so no buckling) and it wasn't until it was in the oven that I suddenly thought "oh...what say water leaks in...?". This was after much hilarity because it had actually floated. I was busy following the instruction to fill with boiling water to within 1/2" of the rim, completely neglecting the fact that as I'd used a spring-form which was deeper than 5cm, the cheese cake itself hadn't come to within 1/4" of the rim, per the instructions! There was no seepage of water. I did do a pretty major job on greasing (I used butter) and dusting with the cookie crumbs, and did take care around the joint, but at the time my mind was on the cheesecake leaking out, not water getting in. Despite my best efforts I only used 50g of the recommended 70g of crumbs and this was after I did a second round on the sides, because with my first effort I'd only used about half the crumbs. 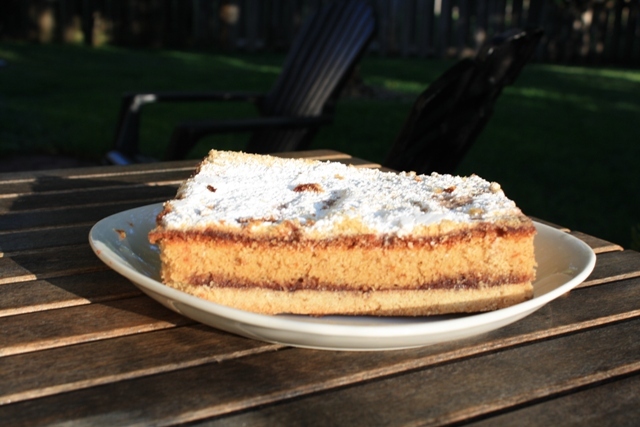 I was surprised that just as with Trish's yummy looking cheese cake the crumbs and butter weren't really that apparent on the finished cake, which met with approval by all who tested it. So no attempts to prevent insanity from this quarter! Even the best springform pans can leak. Cooks Illustrated recommends wrapping any springform pan tightly with foil, when used in a water bath. It's not working... the foil isn't wide enough. Foiled again! ... I added 17 minutes to the baking time... and when I placed it on the rack to cool, about a teaspoon of buttery water leaked out under the latch. But the cake pulls back nicely from the form so... and it smells so good! Poor little Lab Rat #1 has a cold and can't smell a thing. Now to do the topping... Blueberries? This cheese cake was a little wet but very good. I did not add the salt to the cheese and reduced the sugar in the topping by a little under half. I used a smaller form. An antique ceramic cake pan with a 8 point star with 8.5 inch (8 and 9") diameter. No seams to leak. And I finally found some higher fat cream cheese 24% and used full cream and not light cream. The batter went perfect into the form and the oven times were right on. My only comment to the recipe would be to put the eggs into the bowl first and mix them before adding everything else. This time I added 0.5g (pinch) of salt. There is just too much salt in the recipe and I have my limits when it comes to desserts. The more salt, the more sugar that has to be added to balance the flavors. The more sugar... well, I won't get into it. I will say that by reducing the salt, I can reduce the sugar in the topping and they balance quite well according to my tasters. Here's the cake 10 minutes out of the oven. When cool it had a much improved texture over the first cake I'd made (with 14% fat or 14g per 100g) and more supportive of the fruit and not the least bit wattery. I left the cake in the form for chilling & serving. The ceramic mold not only looks better than my cake plate it kept the cake cool to the last bite! Beautiful Trish. Hope it tastes as good as it looks. I have been playing with the Lunch Lady Rolls recipe all week and haven't gotten around to my cheesecake. I guess I know what I am doing tomorrow. I'm intrigued - what is a "lunch lady" roll? Sounds good.. 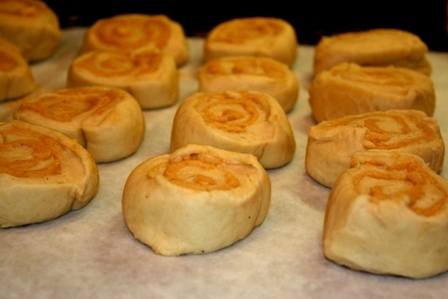 In a discussion about southern style yeast rolls there is a recipe for Lunch Lady Rolls. These have become my DWs favorite. I have made them about 10 times now. I have cut the yeast down from 2 TABLESPOONS to 2 teaspoons. There is no difference in the rise but I think the flavor is better without all the extra yeast. 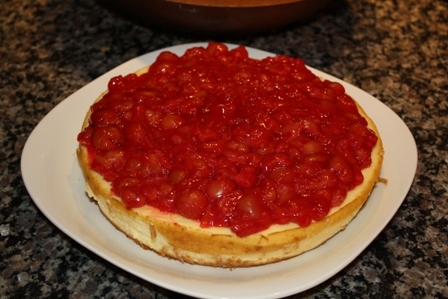 My final recipe was the Sour Cream Cheesecake. No problems or offbeat ingredients. 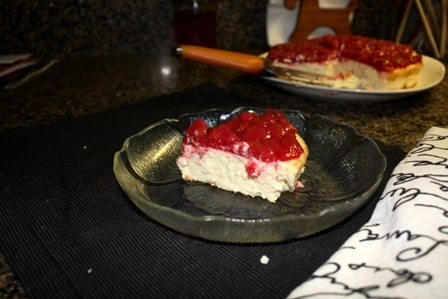 A rich, smooth and creamy cheesecake. Not as heavy or sweet as most cheesecakes that I have had. Just a hint of saltiness helps cut the sweetness even more making this a delicious desert for those that aren't into sweets. How could anyone not like cheesecake? 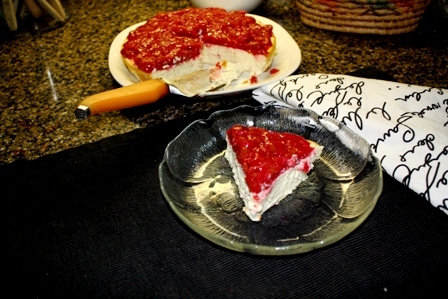 This looks delightful - the texture looks just like the type of cheese cake I like. I too will miss not having a new recipe each week but I must pass on the Macarons. I'm ready to get back into bread! I have a new camera and I can't resist using it. I wish I'd gotten home in time to take the photos outdoors where the lighting is so much better - I'll have to work on the lighting issue when fall and winter come on. At any rate, the cheese cake chilled last night and we cut into it tonight (how's that for will power?) Here it is sliced. I must say this is one of the most divine cheese cakes I've ever tasted. I wouldn't change a thing! Having said that, I'm very sorry this is our last test recipe - I have enjoyed all of you and your photos and trials and tribulations this summer. I hope we can all keep in touch throughout the year with other baking triumphs - Who knows - maybe there wll be a Jewish Bakers Cook book the sequel?